Can I upload AVI to YouTube? Is it possible to upload AVI videos to YouTube? The answer is yes! AVI video files can be uploaded to YouTube easily. It takes only a few clicks to upload AVI videos to Youtube. You only need to identify your AVI video file that you want to upload then upload it to your YouTube account. In addition, you can upload AVI video to YouTube using an incredible software program for Mac that is compatible with Mac computer (macOS Mojave included). This article takes you through how you can upload AVI video to YouTube. It also takes you through how you can upload AVI videos to YouTube with the incredible desktop software for Mac. AVI video can be uploaded to YouTube sing the common way. Uploading AVI video to YouTube should be easy following the step-by-step guide below. Step 1: Get to YouTube and sign in to your account. Enter your correct username and password to sign in. Step 2: After you have signed in, click on "Upload" button. Choose video privacy settings before uploading the video. Step 3: Click the "choose file to upload" button to select the file you want to upload. Select the AVI video to be uploaded. Step 4: While the video is uploading, you can edit the basic and advanced settings. Step 5: Click "Publish" button to complete the upload. If you chose private or unlisted settings, only click "Done" t o finish the upload or click "share" to share your AVI video privately. You will receive an email notifying you that your video has uploaded successfully. 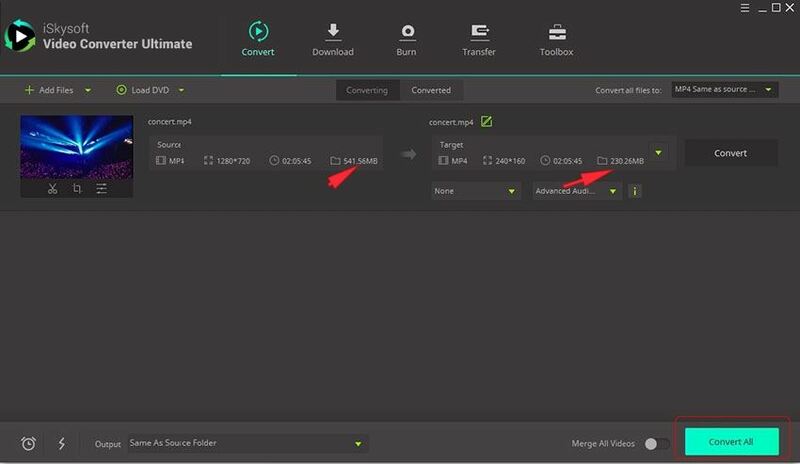 Apart from the method mentioned above, you can also use iSkysoft Video Converter Ultimate for Mac to upload AVI video to YouTube. 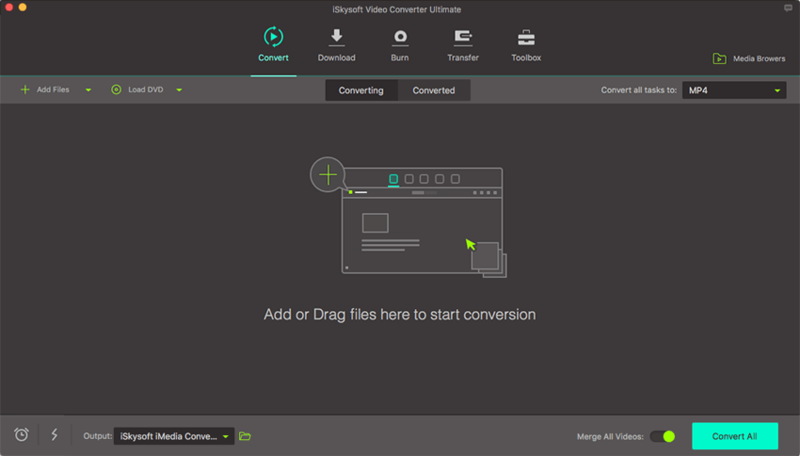 iSkysoft Video Converter Ultimate for Mac is a media converter tool for Mac. It converts media files to different formats. And it also is a software program that can import media files and export them to sharing sites like Facebook, Vimeo, and YouTube. It is capable of converting video and audio files to different other formats. It can quickly convert videos to other formats and maintains its original quality. It is capable of exporting or uploading videos to common sites such as Vimeo, Youtube, and Facebook. It is an editing tool that can trim and add subtitles and watermarks to videos, add effects on video properties such as brightness and contrast and crop videos to smaller parts. It is capable of download videos from the internet sites like YouTube, Hulu, Facebook, Vimeo, Vevo, Dailymotion, AOL, Metacafe, BlipTV, Veoh, VideoBash, LiveLeak, MyVideo, and so on. 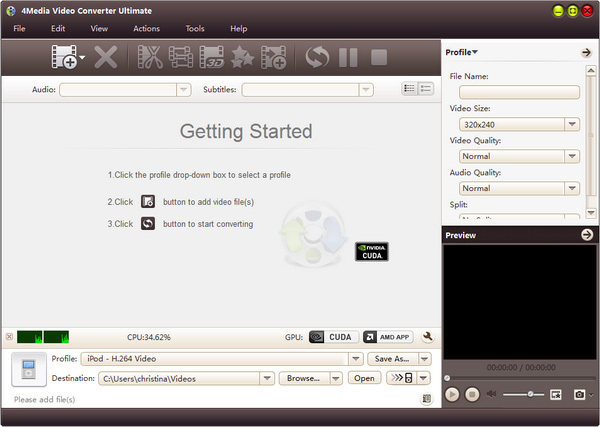 It is able to merge multiple files together and convert them into one video file. 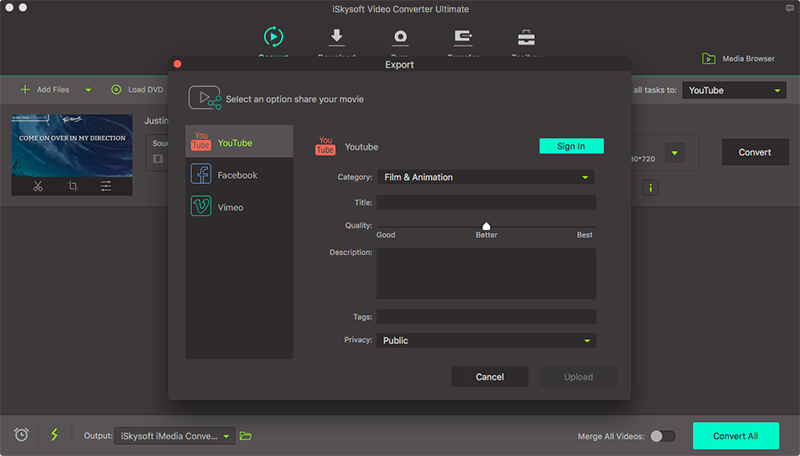 To upload AVI videos to YouTube with iSkysoft Video Converter Ultimate for Mac, you need to use the following steps. Find the AVI video file that you want to upload to your Mac computer. After you find it and it is ready for uploading, simply drag and drop it on the program window. You can upload AVI files by clicking on the "+" button on the lower left. Similary, you can click on "File" and the "Load Media Files". Choose the AVI files and load them to the program. After importing your AVI video file successfully, click the "Export" icon which is on the main menu. From the drop down list select "Uploading to YouTube". Still on Export window, edit video details such as the category, quantity, description and title. After you are certain with the details for your AVI video, upload the video to YouTube by clicking the "Upload" button. With a short time depending on the video size and network connection, your AVI video will have uploaded to YouTube.